My 1-2-3 Cents : Why Can't We Be Friends? For some reason the WWE can't seem to keep any kind of team or group together for more than 18 months or so. We've seen in recent weeks LayCool split up. Ezekiel Jackson was dumped from the Corre a couple of weeks ago. 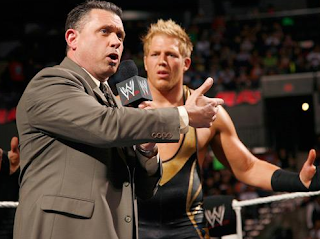 And now it appears that Michael Cole and Jack Swagger are finished. I just wonder if this is a ruse of some sorts for Sunday. But assuming it's not, I don't like the idea of these two "feuding", especially if it means any more wrestling from Cole. The "broadcast journalist" would make a great manager for Swagger. Or if they want to split them up, Cole could perhaps find another wrestler to get behind and manage against Swagger. I don't like that so many friends end up feuding. Tag team wrestling is truly a forgotten art that needs to be revisited. It looks like the makeshift team of CM Punk and Mason Ryan are now working together. They're getting a shot at the gold Sunday. I don't ever remember these two even teaming up before. Now, they're the number one contenders to the tag team titles. This shows you the dire need for a revitalization of the tag team division. I'd be willing to wager that if Punk & Ryan (who I'm not opposed to seeing as a team) win the belts Sunday, Michael McGillicutty and David Otunga will split from them and issue a challenge. Then the "new" Nexus will be finished too. Of course I'm putting the cart before the horse, but I'm going with what's been presented to us for the last 3 or 4 years. Seriously, the WWE in my opinion needs to build up the tag teams. Work on more alliances. And stop creating make shift one night only tag teams. Thanks for reading. Like us on Facebook, follow us on Twitter (@my123cents), and check out YouTube.